NRA-ILA | Would Banning Firearms Reduce Murder and Suicide? 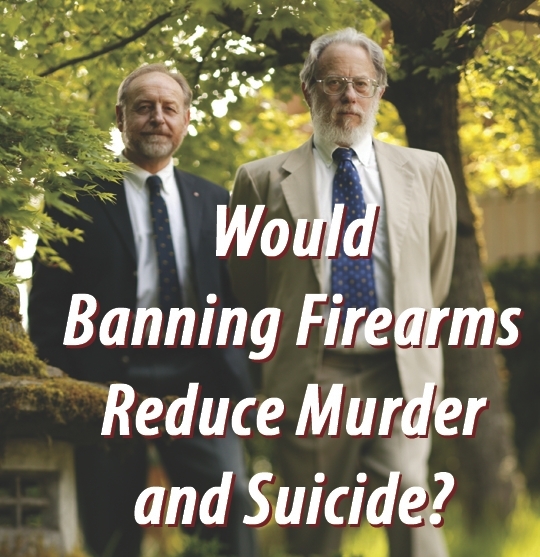 To research that question, researchers Gary Mauser (left) and Don Kates compiled statistics for the rates of murder and gun ownership for nations stretching from the Baltic to the Mediterranean and the Atlantic to the Pacific. Chalk up another big win for the truth. You’ve heard the bogus statistics, skewed studies and incompatible comparisons that the anti-gun lobby and the media elite endlessly repeat ad nauseum in their propaganda, which blames firearm freedom for violent crime. * "A gun kept in the home is 43 times more likely to kill a family member, friend or acquaintance, than to be used to kill someone in self-defense." * "Americans are more likely to be shot to death than people in the world’s other 35 richest nations." * "Every day in America, 13 children are killed by guns, almost a classroom full of children every two days." By drilling you with these anti-gun "statistics" until you can recite them in your sleep, they hope you’ll come to accept and expect them, like the morning sun in your window, or the drone of an air conditioner that you swiftly cease to hear. But now, in an authoritative analysis of dozens of existing studies on the subject, Don Kates, a Yale-educated attorney who served as a professor at Stanford Law School, and Gary Mauser, a Canadian university professor and author, have shattered the anti-gunners’ elaborate façade into a thousand fragments of falsehood. Their paper is entitled, "Would Banning Firearms Reduce Murder and Suicide? A Review of International and Some Domestic Evidence," and it was published this spring in the Harvard Journal of Law and Public Policy--the nation’s most widely distributed law review, with 10,000 copies sent to federal judges and attorneys--where it’s likely to have a big impact on the national debate. But you don’t have to sit on the federal bench to get your own copy. The paper is free. It’s available here for you to download. And it’s a "must read" for anyone who wants to defend firearm ownership with the most up-to-date and comprehensive international information available. You’ve probably heard Sarah Brady, the former head of Handgun Control, Inc., and now of the Brady Campaign, say, "If guns made people safer, America would be the safest nation on earth." Since the early 1980s the u.s. gun-ban lobby has sponsored advertisements suggesting that firearms are uniquely available in the United States, and that as a result, the u.s. has a gun-homicide rate higher than the rest of the industrialized world. As Kates and Mauser deftly point out, both assertions are false. First of all, firearms are abundantly available and widely owned throughout much of Europe, but that doesn’t necessarily lead to high homicide or suicide rates. To research that question, Kates and Mauser compiled statistics for the rates of murder and gun ownership for nations stretching from the Baltic to the Mediterranean and the Atlantic to the Pacific. The problem with many of the existing published studies, Kates explained, was that the raw numbers used in the existing studies were not published. So he and Mauser set out to get the raw numbers and analyze them personally. "We were able to put together figures for nine European nations that had more than 15,000 firearms owned per 100,000 households, and we also had nine European nations that had less than 5,000 firearms owned per 100,000 households," Kates said. "What we found was that the first group, with triple the rate of gun ownership, had one-third the homicide rate of the second group." On the other hand, in Russia--where firearms had been under police-state control for decades--Kates and Mauser found an exceedingly violent society. Although the Soviet communist regime tried to hide the problem from the rest of the world, the collapse of the Soviet Union exposed the truth: Despite those iron-fisted government controls on firearm ownership--almost no Russian civilians owned firearms--Russia had, and continues to have, by far the highest murder rate in the developed world. Kates and Mauser write: "In the 1960s and early ’70s, the gunless Soviet Union’s murder rates paralleled or generally exceeded those of gun-ridden America. While American rates stabilized and then steeply declined, however, Russian murder increased so drastically that by the early 1990s the Russian rate was three times higher than that of the United States. Between 1998-2004 … Russian murder rates were nearly four times higher than American rates." We see much the same thing in Luxembourg, where handguns are completely banned and firearm ownership of any kind is rare. 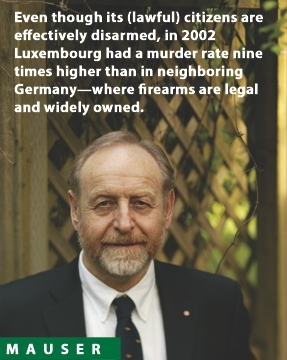 Even though its (lawful) citizens are effectively disarmed, in 2002 Luxembourg had a murder rate nine times higher than in neighboring Germany--where firearms are legal and widely owned. For any proponents of so-called "common-sense gun control" who fail to see the point, Kates and Mauser connected the dots even more clearly in their paper: "Individuals who commit violent crimes will either find guns despite severe controls or will find other weapons to use." Tragically, the same phenomenon seems to place suicide beyond the reach of anti-gun laws. Citing studies of suicide in dozens of nations, Kates and Mauser point to comparison after comparison that shows no link between gun availability and suicide rates. 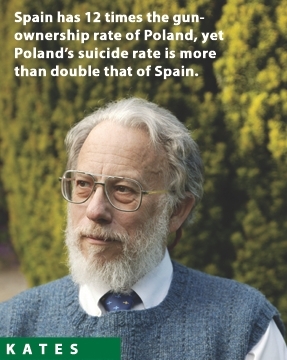 For example, Spain has 12 times the gun-ownership rate of Poland, yet Poland’s suicide rate is more than double that of Spain. Greece has triple the gun-ownership rate of the Czech Republic--and admittedly more gun-related suicide--yet the overall Czech suicide rate is nearly triple that of Greece. Similarly, Finland has over 14 times the gun-ownership rate of its southern neighbor Estonia, yet Estonia nonetheless has a much higher suicide rate than Finland. * [N]either a majority, nor many, nor virtually any murderers are ordinary ‘law-abiding citizens.’ Rather, almost all murderers are extremely aberrant individuals with life histories of violence, psychopathology, substance abuse and other dangerous behaviors. In the absence of firearms, suicidal people simply substitute other means. As evidence, Kates and Mauser point to two powerful examples. In the 1980s, suicide among teenagers and young adults spiked in the u.s., and many blamed firearm availability for the increase. What they failed to mention was that suicide among young adults was rising throughout the developed world--regardless of gun availability--and in many places was rising far faster than in the u.s. Among English youth, for example, suicide increased 10 times as fast as among American youth, yet the preferred method of suicide there was car exhaust asphyxiation. Another tragic illustration involves suicide among young Indian women living on the island of Fiji. When these women marry, often to non-Indian men, they commonly go to live with their husbands’ extended families in less-than-friendly, if not openly antagonistic, circumstances. Perhaps as a result, they have a suicide rate many times higher than that of non-Indian Fijian women. Guns are unavailable to these women, Kates and Mauser report, but that evidently makes no difference: Many still commit suicide--about 75 percent of them through hanging, and nearly all the rest by poisoning themselves with the herbicide Paraquat. Another favorite fantasy of the gun haters is that firearms have some mystical power to transform otherwise lawful, peaceable people into murderers and maniacs. To hear the gun-ban lobby tell the tale, it’s as if firearms were some sort of evil magic charm just waiting for humans to let down their guard so that they, the firearms, could turn the tables on us once and for all. Firearms, they tell us, will turn family disagreements into shooting wars. A gun kept in a closet as a defense against intruders, they say, will instead be used against a spouse in a moment of rage. According to the Violence Policy Center, "the majority of homicide[s] [occur] ... not as a result of criminal activity, but because of arguments between people who know each other." But as Kates and Mauser point out in their study, "These comments … contradict facts that have so uniformly been established by homicide studies dating back to the 1890s that they have become ‘criminological axioms.’ … [N]either a majority, nor many, nor virtually any murderers are ordinary ‘law-abiding citizens.’ Rather, almost all murderers are extremely aberrant individuals with life histories of violence, psychopathology, substance abuse and other dangerous behaviors." What’s more, as Kates and Mauser note, a major national, yearlong study on gun murders in U.S. homes between acquaintances found that the most common situation was one in which the victim and the perpetrator "knew one another because of prior illegal transactions." Read between the lines and you’ll realize what that refers to: Drug pushers murdered by rivals or robbers. Gang members murdered by fellow gang members. Women murdered by stalkers or domestic abusers. In any of these cases, as Kates and Mauser explain, the perpetrators are "all individuals for whom federal and state laws already prohibit gun possession." Do Guns Reduce Crime? Or Does Crime Reduce Guns? Although their data would support such a claim, Kates and Mauser don’t argue in their paper that firearm ownership is the cause of low crime rates in many European nations. As they write in their paper, "It would be simplistic to assume that at all times and in all places widespread gun ownership depresses violence by deterring many criminals into nonconfrontation crime, [although] there is evidence that it does so in the United States …"
Instead, they maintain, with refreshing candor, that some European countries simply have low crime rates, and because of that, those countries never imposed anti-gun laws. So gun ownership is high, and crime is low--it’s just not necessarily low as a result. As an illustration, Kates cites Norway: "The reason Norwegians have guns is for hunting. They don’t keep them for self-defense and they don’t need them--they have a low-crime country." On the other hand, some European nations experiencing high levels of crime subsequently passed anti-gun laws--but those laws failed to have any effect on crime. "The people you need to control are not going to obey the gun control laws," Kates explained. "And the people you don’t need to control, those are the ones who obey. So what you get is, you get either nothing, or you get worse results, with gun control." In the final analysis, this paper places the burden of proof squarely on the shoulders of the proponents of anti-gun laws. For, although higher rates of gun ownership may not necessarily reduce crime in all societies, in no case can it be demonstrated that higher gun ownership rates cause higher crime. * Whether gun availability is viewed as a cause or as a mere coincidence, the long term evidence is that gun ownership spread widely throughout societies consistently correlates with stable or declining murder rates. The relationship between firearms and crime may be one of correlation more than causation, but the correlation is a good one: More guns may not always dictate less crime. . . but more guns definitely go hand-in-hand with less crime. And the advocates of gun bans bear the burden of proving otherwise before imposing more onerous laws. "Whether gun availability is viewed as a cause or as a mere coincidence, the long term macrocosmic evidence is that gun ownership spread widely throughout societies consistently correlates with stable or declining murder rates. Whether causative or not, the consistent international pattern is that more guns equal less murder and other violent crime.